bl.uk > Online Gallery Home	> Online exhibitions	> Asia, Pacific and Africa Collections	> Ryakotta Hill. 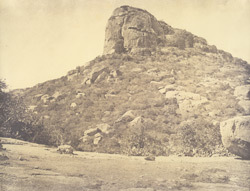 This photograph of Ryakotta hill was taken by Linnaeus Tripe in 1858 and is part of a collection entitled 'Photographic Views of Ryakotta and other places, in the Salem District...with descriptive notes, by J.A.C. Boswell, Esq., M.C.S.' (Madras, 1858). General view of the hill from below: ''The view represents the hill looking N.N.W. It is about 900 feet high, and the table land of the Baramahl is about 1200 or 1300 feet above the level of the sea''. Tripe was in charge of one of the battalions of the 12th Madras Native Infantry, a regiment funded in 1824 and stationed in Madras. In 1855, Tripe was commissioned to take photographs for the British East India Company and the Madras Presidency which resulted in six albums, one of which was of Ryakotta.